Troll Lord Games - View topic - OrcaCon 2017! I will be running 5 (that's FIVE!) 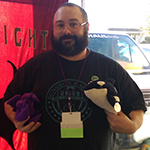 sessions at OrcaCon 2017 in Sunny Everett, WA. January 13th - 15th, 2017. The Maze is an RPG using the Castles & Crusades system (updated, modernized D&D 2e clone) for 4 - 6 players. You begin as 3rd level characters in a party of strangers teleported into a dungeon. You must discover the way out of the Maze before the denizens therein discover you! Your host is Trentin C Bergeron. All games are currently wide open! Spread the word! OrcaCon 2017! !